StairGlide NY sells lift chairs across Long Island, which are often a necessity for disabled individuals. We cater to those with limited mobility, whether you are elderly, injured, or have another complication that may make stairs difficult to climb. With our line of products, you’ll have the control you may think you lost. They easily attach to the staircase in your home, allowing you to access any part of your home whenever you need it. You’ll no longer have to worry about possibly hurting yourself while going up the stairs, or waiting until a friend or relative comes over to help you. Our chair lifts will give you the same freedom that you used to have in your Long Island home. Our products make life easier for you, because you’ll no longer have to worry about having to move to a smaller home without stairs. We understand how important your home is, especially if it’s the one you originally grew up in or have paid off the mortgage for. That’s why a chair life will make you feel even more comfortable your Long Island home. You’ll feel greater stability and won’t have to worry about dangers, such as falling due to a misbalance. Our Long Island company prides ourselves on our wide selection of lift chairs, so you’re sure to find one that will suit the staircase in your home. 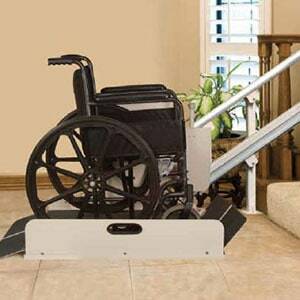 Just a few examples are curved and straight lifts, as well as wheelchair lifts and ramps. These are all designed to bring you the greatest convenience and comfort. In addition, StairGlide NY offers both completely new installations along with refurbished chairs. This inventory of lift chairs will help you decide on one that’s just right for your Long Island home’s budget. In addition, they’re all under warranty. When you’re dependent on a lift chair to navigate your Long Island home, you can’t afford to have it suddenly break and require a costly repair. As a result, our warranties are for your piece of mind. No matter what design you choose, you’ll receive the reliability you need for your everyday life. In addition, your chair will be comfortable and continue working for many years to come. Should you ever experience a problem with your chair, we can repair it as soon as possible. That’s because we understand how critical it can be when you can’t access all of the floors of your home. In addition, we can customize lift chairs to suit your needs, as well as your Long Island home’s staircase design. We also offer rentals, which are ideal for those with short-term needs. In fact, we even offer same-day appointments for your convenience. We’ll help you determine the best lift chairs that could suit your Long Island home’s needs. It’ll be an easy process with our 24/7 service when it comes to installations and estimates. Because StairGlide NY is so skilled at installing our products, we’ll perform the work quickly so you can use your new chair as soon as possible. Get in contact with StairGlide NY at (631) 647-8855. We pride ourselves in only providing the finest quality products for our customers. Because we want you to be truly happy with the chair you choose, you’re able to try our lift chairs for yourself at our Long Island showroom. Come visit us today.